Willy's next job was another Porsche... yes I know, I'm sorry, but when we get a run, we get a run. The last time it was four Maseratis in ten days, not long before that it was TVRs -- but we always seem to have Porsches when I'm writing articles and taking photos. But I'm not bored with them so I hope you aren't either? The car was washed and clayed to get the paintwork as clean as possible and then it was driven outside in the natural light- as usual it clouded over at this point. As mentioned in Part 1, Willy started off by testing on an upper surface. The rear quarter is perfect for this because it's flat enough to work on easily but curved enough to reflect light in a number of directions -- when I'm taking photos of Porsches, it's an area I am always drawn to as it is one of the most distinctive features of the car. 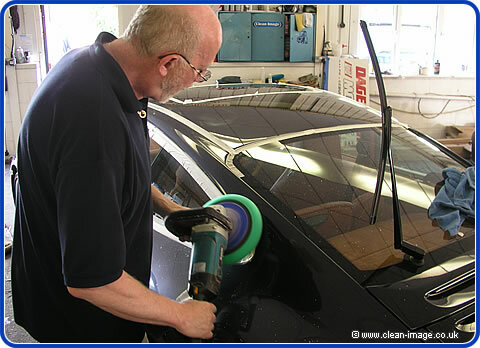 Once he had settled on what pads and polishes he was going to use in what order the car was brought in, taped up and work began using a lamb's wool buffing pad. This is the part you normally don't see! 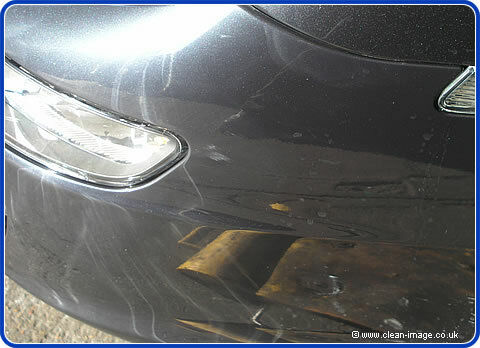 The first stage will often make the paintwork look worse and cover it with micro scratches -- that's why you need nerves of steel for this job. The customer had watched willy for the first hour and admitted he was nervous, luckily he wasn't around to see this! It looks dreadful doesn't it? 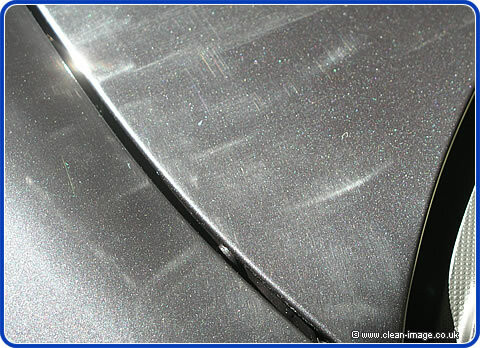 The wool pad has left thousands of fine scratches all over the paintwork, many people call these swirl marks, but I prefer to call them holograms or buffer marks. The funny thing is that the car looked amazing at this point, really glossy, until you saw it in this really harsh light. As you can imagine this puts all people who do this job in a rather difficult position with all cars they do, as a car can look great, but then you see it in a different light and it looks dreadful. You could buff a car on a normal cloudy day and it looks great until the sun comes out... even then you might only see this kind of swirl marks from certain angles at certain times of the day. This is why we use lights and take great care to inspect the car from all angles, turning the car through 360° with 2-3 people checking the car over. 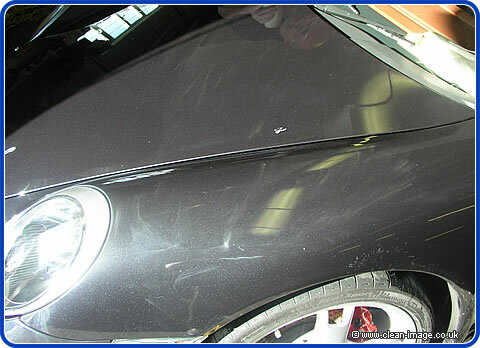 You can actually see above that there are some individual scratches, these are the original swirl marks on the car. The micro scratches left by the wool pad are too fine to see individually, you only see them collectively as a smudge. But the fact that the original swirl marks remain in this area goes to show just how little by little the buffing works -- we aren't taking off a large amount of paint as many people might imagine. 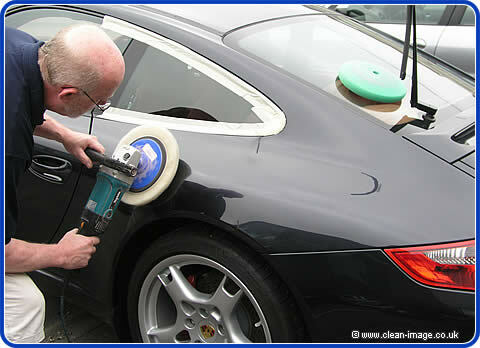 Willy then switched to a softer Green polishing Pad and a finer polish, this would probably still leave holograms on a car with paintwork as soft as this one was, but there is still no need to worry because there is a Black finishing pad and even finer polishes (compounds).